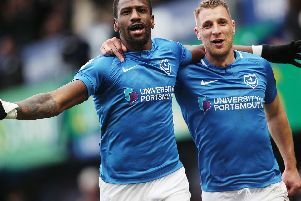 MICHAEL BIRMINGHAM admits it’s a pity Sam Smart hasn’t been given a chance with Pompey. And the Horndean boss is convinced the Denmead talent has a great future ahead in the professional game. Smart is currently impressing on trial at League One side Sunderland, while Sheffield Wednesday have run the rule over him. The current Basingstoke Town winger has also been compared to Raheem Sterling by manager Terry Brown. Smart was coached by Birmingham at Horndean before departing Five Heads Park for the Dragons. The Deans manager rates the 20-year-old as one of the most exciting prospects who’s been under his tutelage. And Birmingham feels Pompey should have handed Smart an opportunity. He said: ‘Sam is a shining example of what can be achieved through hard work and a desire to listen and learn. ‘He is unbelievably quick – I don't think I have seen anyone quicker in my life. ‘He is the sort of player that every time he gets on the ball he excites you. ‘The only two players who have got me up on my feet when they are on the ball are Sam and Alfie Rutherford at the Hawks. ‘He may not be very big but you shouldn't have to be a 6ft 4in athlete to make it in the professional game. ‘It is great to see someone from grassroots football getting the chance. ‘It is a pity a Denmead lad is not getting the chance with his local Football League team. I am sure the Pompey fans would love to see a home-grown talent making it with them. Smart won a university scholarship in America but swiftly returned home. He again linked up with Horndean and lit up the Wessex League. Birmingham added: ‘That season Jack Maloney scored 19 goals and 18 of them were from the penalty spot. Sam must have won 17 of those penalties.